On this day in 2006, Milan Mandaric confessed: I can’t believe how much I’m missing Pompey. The former Blues chairman revealed selling the club to Sacha Gaydamak had left a massive void in his life. Mandaric admitted the goodwill of Pompey supporters towards him and the passion they showed for their team had been hard to replace. The Serb had been watching games all over Europe and had been in talks about a takeover at Leicester. But he had not felt the same buzz he got from being involved at Fratton Park and the club he saved from extinction in 1999. Mandaric told The News at the time: ‘Not having Portsmouth in my life is a lot harder than I thought it was going to be. ‘I miss Portsmouth and I miss the people. ‘I have so many happy memories and thoughts about the club and the city. ‘I developed a bond with the people of Portsmouth. ‘It didn’t matter if it was a taxi driver or the Lord Mayor. I got the same positive feeling for me. And I miss it. ‘The other day I was getting on to a flight. ‘I asked her why and what she was talking about and she told me she was from Portsmouth. ‘That had an effect on me. ‘There were some difficulties in my time in charge. ‘But that is one of the things that makes it special. ‘You need to come through the dark days to appreciate the good ones. ‘I’m proud of what I did for the club and where they are today. I’m happy for the supporters. ‘They welcomed me into the city and they thought of me as one of their own. ‘You can’t buy that kind of bond. 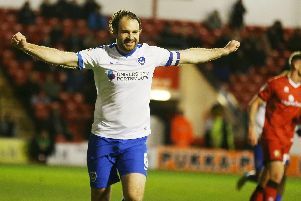 ‘I still feel like a Pompey fan and of course I’m a happier person when they win.